A man has been apprehended after he allegedly tried to buy goods with fake bank alert in Lagos state. 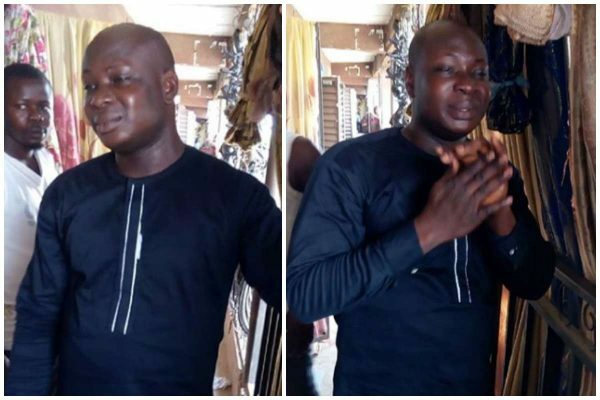 Photos have emerged showing a Nigerian man caught while trying to buy goods with fake bank alert from a store at Promaxx plaza Iyana-era bus stop, Ijanikin Lagos state. Mrs Lawal (who is also a trader) shared the man's photos on her Instagram page, as she narrated how the suspected fraudster was caught. She revealed that the suspect bought goods worth over seventy thousand Naira, only to send a fake alert to the seller. "This just happened at promaxx plaza Iyana-era bus stop, ijanikin Lagos state. This gentle but wicked man walked in to buy goods from my neighbour and make transfer of 70k+ but it was a fake alert. Thank God for his mercies. For this kind dry period na him one stupid person wan rip us of our own hard earned sweat."